The surface of Mars bears imprints of structures that resemble fluvial steam networks on Earth. Scientists therefore assume that there must have been once enough water on the red planet to feed water streams that incised their path into the soil. For years, however, scientists have been debating the source from which this water must have originated: was it rainwater that caused streams and rivers to swell? Or did water ice in the soil melt due to volcanic activity, and seep out to form rivers? Each of these scenarios leads to a completely different conclusion about the climatic history of the red planet. 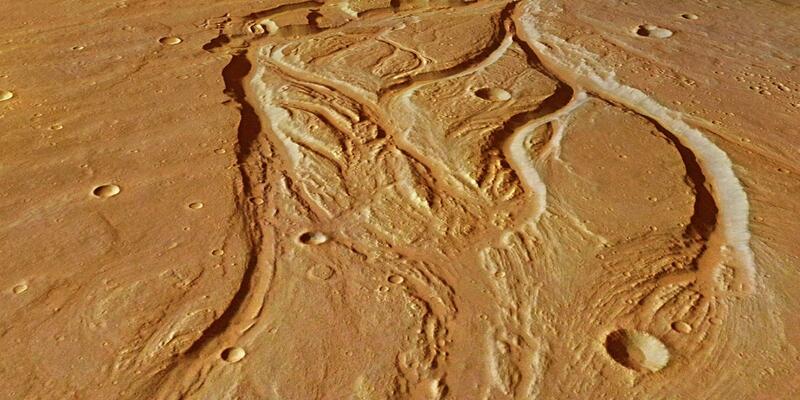 A new study now suggests that the branching structure of the former river networks on Mars has striking similarities with terrestrial arid landscapes. This has been demonstrated in a recent paper published in Science Advances by physicist Hansjörg Seybold from the group of James Kirchner, ETH professor at the Institute for Terrestrial Ecosystems, and planetary specialist Edwin Kite from the University of Chicago. The distribution of the branching angles of the valleys on Mars is very similar to those found in arid landscapes on Earth. According to lead author Seybold, this implies that there must have been a similar hydrological environment with sporadic heavy rainfall events on Mars over a prolonged period of time and that this rainwater may have run off quickly over the surface shaping the valley networks. This is how river valleys develop in arid regions on Earth. For example, in Arizona, researchers observed the same valley network patterns in a landscape where astronauts are training for future Mars missions. Valleys in arid regions fork at a narrow angle. Conditions such as those found in terrestrial arid landscapes today probably prevailed on Mars for only a relatively short period about 3.6 to 3.8 billion years ago. In that period, the atmosphere on Mars may have been much denser than it is today. "Recent research shows that there must have been much more water on Mars than previously assumed," says Seybold. The big question is where the water has disappeared to over time. "It's likely that most of it evaporated into space. But it could still be found in the vicinity of Mars," says the physicist., " but this is a question for a future space mission".